I studied Physiotherapy with the simple aim to help people return to health and stop needless suffering that prevents us all doing what we love, whether that is sport or playing on the floor with your grandchild. Seeing people benefit from removing these limitations is what fuels my passion. The human being is a remarkable system of inter-relating tissues that are innately intelligent. Given the right information your body will heal itself. I aim to show your body what it needs to learn to heal, and inform you of things you can be responsible for to help along the way through exercises and lifestyle choices. While rest is sometimes a necessity, it is not the magic cure and we often find maintaining your activity levels will actually accelerate your recovery. I feel lucky to be able to say that I love my job, Physiotherapy is my passion and my hobby. I am always developing my practice to absorb new techniques and will remain excited to continue my exploration into healing your body. I look forward to the challenge of helping you realise your health potential. Sacha grew up in Bath. She graduated in 1998 from Coventry University with a degree in Physiotherapy and after taking some time out to travel the world, started working at Sheffield Teaching Hospitals NHS trust where she completed her Junior Rotations. Having moved to London, Sacha worked for both the NHS, helping to set up an acute Physiotherapy service within A&E at Whipps Cross Hospital, and in private practice. Sacha moved back to Bath in 2007 where she started her own private practice and also worked at Nuffield Health in Bristol alongside Orthopaedic and Plastic surgeons working to rehabilitate post operative cases. 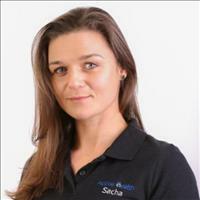 Sacha has post graduate qualifications in Acupuncture, Trigenics, Tui Na, Sports Strapping techniques, Active Release Technique (ART) and is a fully qualified Pilates Instructor with certification in Class Instruction, Matwork and Ante and Post natal tuition. Now a Director of Active Health and she is our lead physiotherapist.